Judy has studied with teachers such as Romana Kryzanowska, Bob Lieken, Alycea Ungaro, Brooke Siler, Kathy Corey, Jay Grimes, Irene Dowd, and Michael Fritzke and Ton Voogt, to name a few. She is passionate about learning more for her own knowledge and to pass on to her clients. Judy has over 12 years of experience teaching and continues to grow her knowledge by attending workshops and conferences all over the country. Mountain Laurel is a fully equipped studio, offering only the best of equipment from Basil, Gratz, and Peak Pilates in the Pocono region. Develop your best-toned, flexible body. Perfect on it's own, Pilates will also balance out the effect of your other fitness activities. 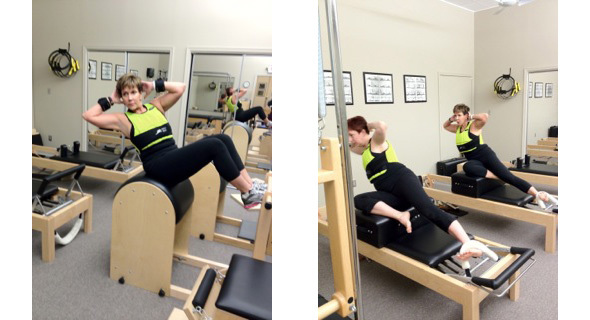 Train privately or as a duet or trio on the reformer, Cadillac, towers, wunda chairs, barrels, pedal pole. Small group mat classes are also available. If you're interested in creating your own group, no problem, we aim to please! Whether you're an elite athlete or just someone who wants to whittle your middle, Pilates offers an interesting, balanced and fun path towards your goals. In addition Judy has added Iron Wear Fitness accessories to her practice to challenge the balance, strengthen the core, and strengthen the bones that are critical as we age.